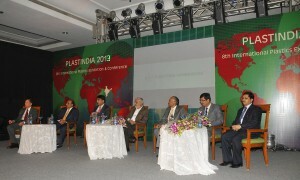 Mumbai, 10th May, 2013: PlastIndia Foundation, today announced Gandhinagar,Gujarat as its venue for the country’s largest plastic trade show, PlastIndia 2015 which is the ninth Plastics Exhibition & Conference. The international standard arena is spread over a large area of 1,00,000 sq mtrs which is 23% more exhibition space. The capital of the state, Gandhinagar is favorable for all types of business class which will provide a gateway for foreign companies intoIndia. According to the recent CARE ratings agency update, Gujarat contributes over 7% toIndia’s GDP. It has come to establish itself as a strong growth engine with a decadal growth of 10% (2001 – 2011). The state now contributes more than 13% in manufacturing sector and 11% in primary sector output of the country. Plastics are one of the significant raw materials used for various purposes ranging from household applications to industrial & high-end automobiles to hi-tech space shuttles. The forthcoming 9th PlastIndia 2015 Exhibition & Conference will encourage the Indian plastic industry to showcase their products and capabilities to international plastics buyer fraternity. PlastIndia 2015 will offer a global platform for buyers and sellers from plastic industry to enhance their business prospects, to establish strategic alliances, technology transfer etc. Showcasing a platform of international standards, PlastIndia 2015 will pave the way for intra-industry cooperation and will ensure bridging the gap between international community and Indian enterprises while exploring bigger business avenues. PlastIndia Foundation is the apex body of major Associations, Organisations, and Institutions connected with plastics including Government and Semi-Government Organisations. The main objective of the Foundation is to promote the development of Indian plastics industry and to assist the growth of plastics and related materials and their products. It is dedicated to the national progress through plastics and is striving hard to makeIndiaa preferred sourcing base for plastics products for the world. Working as a catalyst, the Foundation works to build awareness of the significant contribution made by plastics to society and the environment. It also creates a positive policy framework with all statutory entities and increases per capita consumption of plastics, encourage exports thereby significantly contributing to national growth. In order to enhance the image and the growth of Indian Plastics Industry, the Foundation holds world-class exhibitions inIndiaat regular intervals, where it provides opportunities to demonstrate the industry’s capabilities.